Learning a loved one has Alzheimer’s disease or another dementia can be frightening. But preparing for the behavioral symtoms that could result may help both individuals and their families better cope with the disease and keep loved ones safe. Always ask yourself if that individual has an unmet need that could trigger a wandering incident. Proactive steps can help families reduce the risks for wandering and be better prepared if an incident occurs. Consider setting up an alert network through the Missing Senior Network℠ program. This free web service allows family caregivers to create an account with a list of contacts to alert in the event a senior goes missing. The service then provides the family caregivers a way to alert the network of friends, families and businesses to be on the lookout for their missing senior if he or she wanders. Setting up this network in advance can help families be prepared to handle any incident of wandering. Also, you can help protect an individual at risk of wandering by ensuring he or she always is wearing identification. Consider an ID bracelet, such as one from the MediAlert® + Alzheimer’s Association Safe Return® Program. This is a fee-based 24-hour nationwide emergency response service for individuals with Alzheimer’s disease or a related dementia who wander or have a medical emergency. Safeguarding a home is one important preparedness step family caregivers can undertake for a loved one prone to wandering. Many products exist on the market to help keep older adults with dementia safe at home. These include alarms that attach to doors and windows, covers for doorknobs that help prevent an individual from leaving home, and higher-security locks. Other strategies include placing locks out of eye-level view, and painting doors and door frames the same color as walls to “camouflage” exits. Make a path in the home where it is safe for an individual to wander. Closing off certain parts of a room or locking doors can help achieve this goal. Such paths also can be created outdoors – in a garden, for instance. One family caregiver remembers her husband getting outdoors in the middle of the night in the dead of winter. “A fence kept him from wandering from home so he came into the garage. He was banging on the door at 5 a.m., which woke me up. If he had gotten out of the yard, he would possibly have died from the cold.” Install barriers and fences in the yard to help ensure that a loved one doesn’t wander from home or into unsafe territory. Keep walkways well-lit. Add extra lights to entries, doorways, stairways, and areas between rooms and bathrooms. Use night lights in hallways, bedrooms and bathrooms to help prevent accidents and reduce disorientation. Remove and disable guns or other weapons. The presence of a weapon in the home of a person with dementia may lead to unexpected danger. 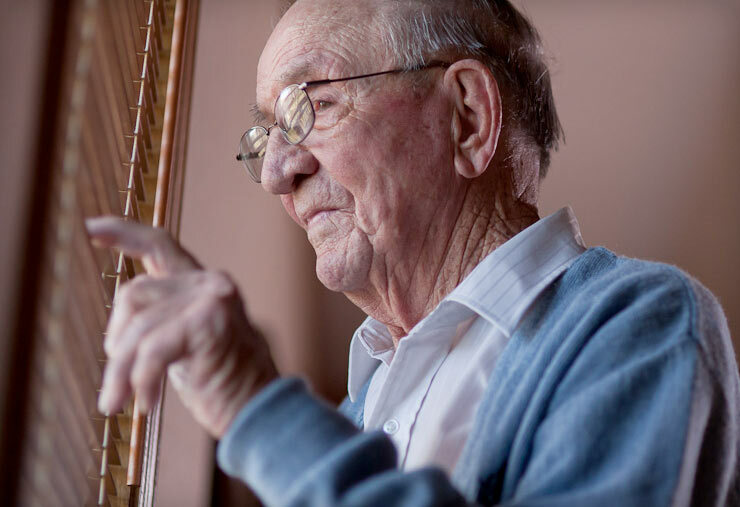 Dementia may cause a person to mistakenly believe that a familiar family member is an intruder. Place medications in a locked drawer or cabinet. To help ensure that medications are taken safely, use a pill box organizer or keep a daily list and check off each medication as it is taken. Check out Simple Meds at SimpleMeds.com for a way to help seniors manage medications. Remove tripping hazards. Keep floors and other surfaces clutter-free. Remove objects such as magazine racks, coffee tables and floor lamps. For more information from the Home Instead Senior Care network and the Alzheimer’s Association about safeguarding a home for someone with Alzheimer’s, visit CaregiverStress.com and the Alzheimer’s Association. You’ll also learn more about how to deal with wandering and other common Alzheimer-related behavioral symptoms in the book “Confidence to Care”, as well as the accompanying free mobile app. While there are many ways to be proactive in helping to minimize wandering behavioral symptoms, it’s also important to know what to do when the unexpected happens. Check out what to do in a Wandering 911 situation. good article! My mom is 98 and has dementia and uses a walker still. I leave her brief notes like “get sandwich out of fridge”, “turn on the coffee pot”, or “I’m at work will be back soon”. I used to leave a whole notebook page of a list of things for the day but eventually that became too much. So I found short notes work better now. I also leave a glass of water at each of the places she spends the most time (next to the bed, in the bathroom, at the dinner table and at her chair watching TV) during the day so she doesn’t have to try to manage that with the walker. Myself and my mother agreed that the best way to prevent this without causing a fire hazard or restricting freedom, by bolting the doors, was to be able to track her movements and be alerted when she left the house. We found a smart tracking device that went in the soles of her shoes, enabling us to be notified on our smartphones when she left. When my Mom began to experience difficulty swallowing, I recalled a Scripture that mentioned anointing the sick with oil and they shall recover. So, I poured a teaspoon-sized (approx.) amount of Extra Virgin Olive Oil into the palm of one of her hands and told her to rub it on her neck. I watched as she did. Within 5 to 7 minutes (approx.) she was able to eat without difficulty. Within the past month or so we’ve done this about 3 different times/days when she experienced some difficulty swallowing and each time the results have been equally swift. We have learned that the brain needs healthy fats. However, my Mom has never liked having healthy, fresh oils (extra virgin olive oil (EVOO), unrefined cold-pressed coconut oil) on her food. So, I’ve applied EVOO onto her scalp & forehead; she’s applied it too, when I give it to her to do so. Doing so soothes her as if seeping into her system. Also, I’ve given her both oils (separately on numerous days) to apply to her abdomen & body when she’s had digestive discomfort. Each time, the oil applied to her abdomen has relieved the discomfort & her appetite was restored.